The spirit of the United States is always called on around the 4th of July. He's occasionally invoked on some of the other holidays, too... Memorial Day. Once, he gave a pretty impressive speech on Flag Day, though he got somewhat drowned out by the dancers flipping the flags all throughout the street. Still, if it isn't gearing up for the summer months, poor Uncle Sam doesn't often get much time out in the sun. That's why we're trying to help him find other festivities to enjoy. Now, we think he'd make a great stand-in for Christmas. He's already proven that he makes red look pretty great, so Uncle Santa could be a perfect holiday spirit! Though, his aggressive 'We Want You' attitude might confuse the reindeer. How about Easter? We're often all about bright and shining colors to celebrate the spring. Stripes are also totally in with all the egg decorations. Stars... maybe not so much. Though, there is one season where all spirits belong! 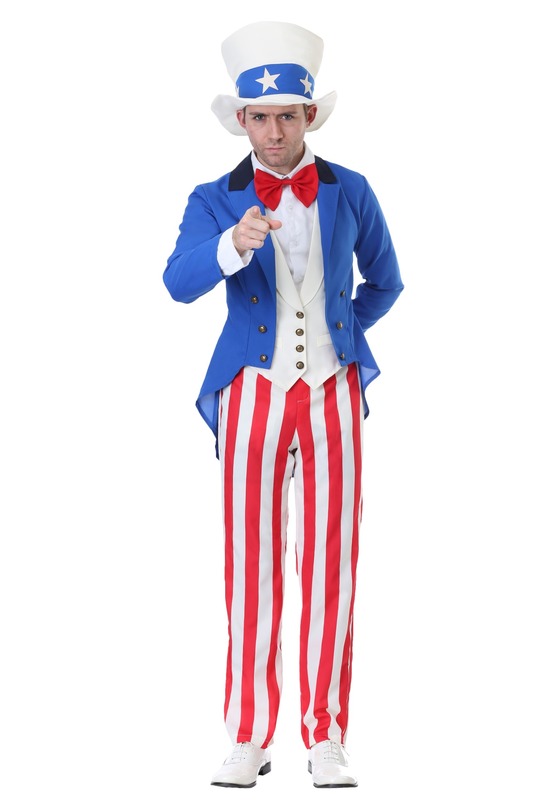 Make your Halloween a truly inspiring time with this exclusive Uncle Sam Costume. Our team of Star Specialists joined up with our experts in Stripe Decor for a game of anti-gravity paintball and were shocked that they'd never worked on a design together. 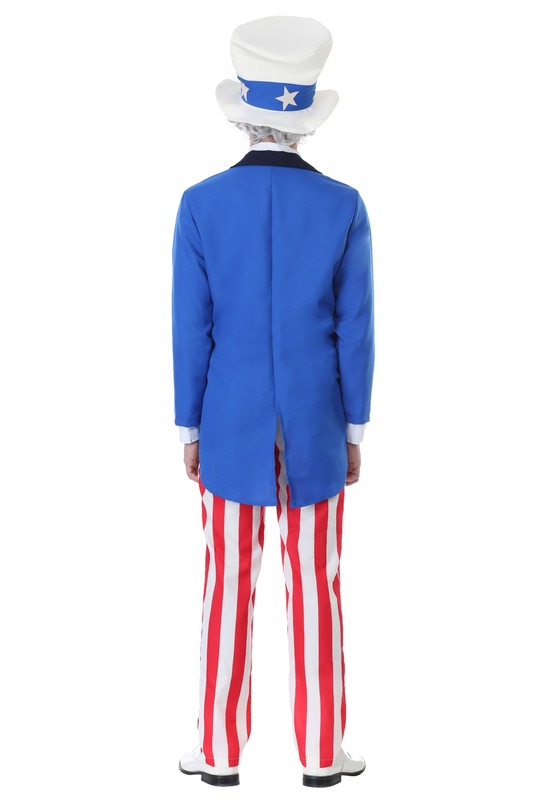 They fixed that in a big way with this navy blue jacket, white vest, gleaming red and white striped pants, and the iconic star-banded top hat of everyone's favorite Uncle. Finish off your transformation into the spirit of America with the red bow tie and claim any season for the U.S.A.! 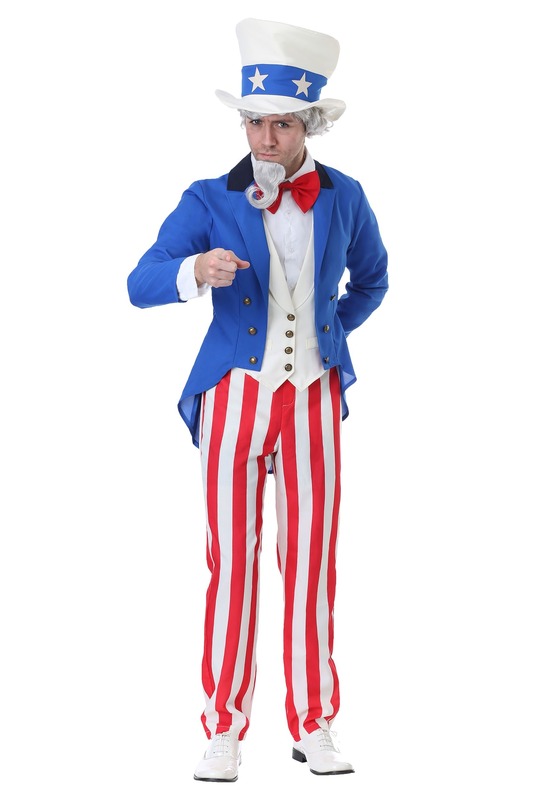 Once you've slipped into your new role as Uncle Sam and realized that you can claim any season to show off your patriotic pride, the real question is wondering what mysterious powers that the spirit of the United States possesses. Conjure fireworks and starbursts from your hands? Either way, you'll look amazing while you figure it out!